Don’t Miss the Milestone 25th Annual Event! 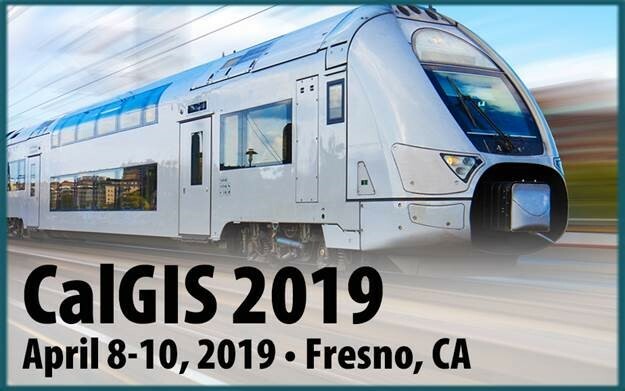 The URISA chapters in California and the California Geographic Information Association, come together every year to present CalGIS. GIS professionals attend CalGIS to network with others and learn about new techniques, skills and innovative products that get the job done. We expect approximately 300 GIS users from all regions of the state. Our attendees come from every sector of GIS and related fields, including federal/tribal/state/local government agencies, GIS service providers, and end users of software, data and applications. All sponsorship levels include at least one exhibit booth space and one or two event registrations. CalGIS offers varied levels of sponsorship to ensure all companies can participate. Booth space is limited. To make the most of your benefits, please return your contract with payment right away. 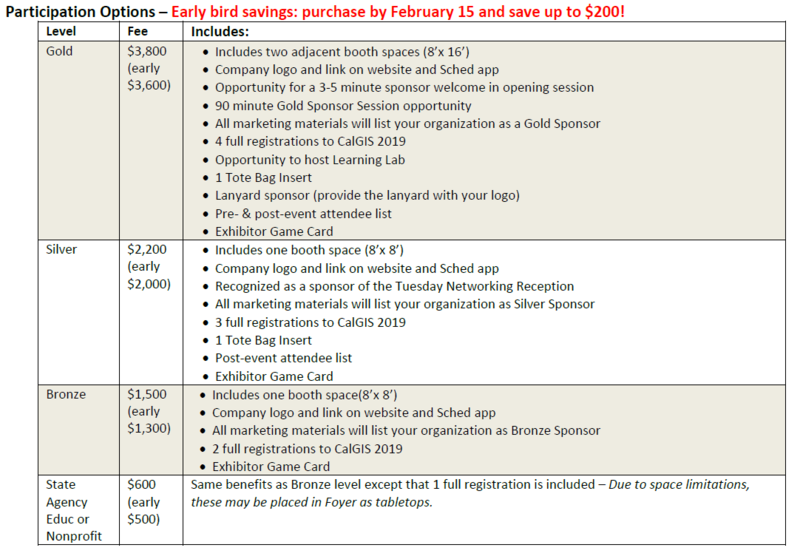 Enjoy unparalleled access to CalGIS attendees! The Exhibit area is adjacent to the General Session room where keynote addresses, general sessions and the conference lunch will take place and to the breakout sessions/workshop rooms. Coffee breaks and the networking reception will take place inside the Exhibit area. CalGIS 2019 registration is immediately outside the entrance to the Exhibits. Your representatives will have ample opportunity for multiple attendee ‘touches’ at CalGIS 2019! Exhibitor Game Card: Each participating organization can include a question on the conference game card which every attendee receives. Instead of just stopping by your booth and asking for a stamp, the attendees are prompted to ask your booth reps a question to start a conversation. Start thinking now about what you’d like to talk to CalGIS attendees about. Completed cards will be entered into a raffle for exciting prizes, drawn on Wednesday afternoon. Monday, April 8, 2019: Workshops, meetings and a networking event are featured on Monday. Expo Décor was selected as the company to handle shipping, furnishings, etc. Events will take place at the Doubletree Hilton (2233 Ventura Street, Fresno, California, 93721), the largest full-service hotel in the Central Valley, located in the heart of California, just off of Highways 41 and 99. The venue offers easy access to Fresno Yosemite International Airport (a complimentary airport shuttle is available for registered guests), Fresno State University and shopping, dining and entertainment options in the Tower District. The full-service Fresno hotel is within driving distance of Kings Canyon National Park, Yosemite National Park and Sequoia National Park. CalGIS negotiated an affordable $139 single/double hotel room rate (with complimentary wifi access) at the hotel for CalGIS attendees. The group rate will be available until March 24 or until the room block is depleted. A limited number of government per-diem rooms will also be available. Fresno is a city in California's San Joaquin Valley. Created in the early 1900s, Forestiere Underground Gardens consists of Roman-catacombs-inspired subterranean passages and courtyards. Fresno Chaffee Zoo has sea lions and a stingray touch pool. Sprawling, trail-lined Woodward Park is home to the Shinzen Japanese Garden. The city is a base for Yosemite National Park, with its waterfalls and giant rock formations. Start planning your visit today!